A couple of weeks ago my husband went overnight to pick up our son. That means I got to eat a pizza he'd never touch with a 10' pole....Veggie Delite. The best part about this pizza? I used homegrown veggies. Prepare pizza dough as directed. Spread dough with pasta sauce and layer vegetables. Don't they look pretty? So colorful! Sprinkle with salt and dried basil. Sprinkle with cheese and bake as directed. It was so good! When I was younger, I did NOT like bell peppers or fresh tomatoes on my pizza. But as I've gotten older, I've come to love the sweet yellow bell peppers and fresh tomato on pizza is AMAZING! I'm so glad I grew out of that! I missed my hubby while he was away overnight, but I sure did love having a yummy pizza! 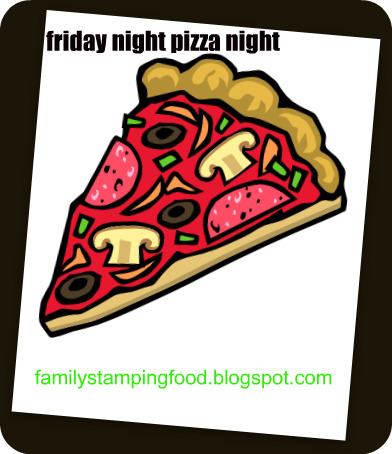 Have a great Friday Night Pizza Night with your family! This looks absolutely delicious! Would you like to link it up with my Vegetarian Foodie Fridays carnival? I'd love to have you! This lloks great! We have been having cheese pizzas lately, but you have inspired me to add some veggies to the pizza instead of putting them all in a side salad! Love this!!!! it looks so yummy!!! I love veggie anything.